I don't know much, but I do know that somehow I found myself at this reading one time and while I had no idea who this person was (because I live under a rock) she was definitely one of the people that made an impression on me if only because she seemed to make some White People really really uncomfortable. CHRISTY NAMEE ERIKSEN a.k.a. 정나미 Jung Na Mee is a korean adoptee spoken word poet and proud mama. She has performed at Patrick’s Cabaret, Intermedia Arts, Hamline University, Pillsbury House Theatre, and Equilibrium’s spoken word series at The Loft Literary Center. 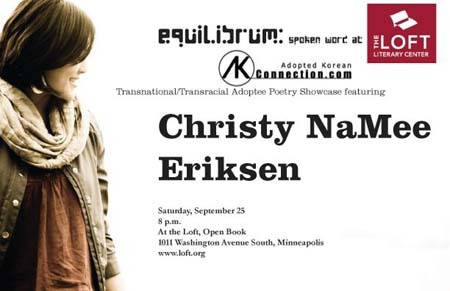 She is a featured artist on the 2009 Minnesota Spoken Word Album of the Year, “¿Nation of Immigrants?” produced by The Loft Literary Center. She has been published in Alaska Women Speak, The Fulcrum, Tidal Echoes, and Race-Talk.org. Christy has shared the stage with Ishle Park, Mayda del Valle, Bao Phi, the Good Asian Drivers and other really cool people. Her Scandinavian father always asked that she "try to be good", but she holds a B.A. in Social Justice (concentrating in Racial Justice) and a Certificate in Conflict Studies from Hamline University anyway. 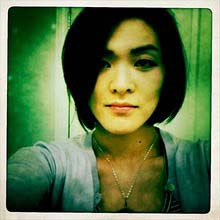 She co-created and contributes to an ibyang (korean adoptee) poem-a-week blog called THURSDAYS. Check it out.